Not Your Mom's Musical Theater | Innovative. Lesser-known. Edgy. Today kicks off a full weekend of Not Your Mom’s music and theater productions at the Hatbox Theatre in Concord, NH. Are you ready for the awesomeness? Tonight, join Ross Malcolm Boyd & Jamie Feinberg, founder of NYMMT, in concert! They’ve spent the last year traveling the country performing & living in an RV, and they’ve brought their new duo act, full of tight harmonies and quirky originals and covers, to New Hampshire! They’ll even improvise a song or two – and your ticket purchase gets you a FREE double album of their original music. That will be tonight at 7:30 p.m., and there are plenty of tickets available at the door (but advance tickets help them know how many CDs to have on hand). Tomorrow, Jocelyn Duford’s breathtaking, intimate alphabet cabaret returns to Concord. We guarantee you’ll be spellbound as this actress and singer takes an alphabetic journey through musical theater. For ages 12 & up due to a few songs with adult language. If you’ve ever experienced her work, you know what a special event we have in store for you. Just don’t miss this. Two shows – Saturday at 7:30 p.m. and Sunday at 2 p.m. Please join us – and consider helping us spread the word that NYMMT is in town this weekend. Thanks and hope to see you soon! Have you checked out the Hatbox Theatre yet? It’s Concord’s most exciting new venue in the Steeplegate Mall. It’s a small, unique space perfect for the style of intimate performance that we love, and we’re happy to return there this fall. September 29 at 7:30 p.m., you can catch Ross Malcolm Boyd & Jamie Feinberg in concert. They’re bringing their new duo set to New Hampshire for the first time this fall, and they’ll even be performing some musical improvisation from their theater improv days with Granite State Theatresports. Join them for a mix of originals and covers – and maybe some puppetry! – in a night you won’t soon forget. A custom version of one of Ross’ EPs is included in the price of admission. September 30 at 7:30, and October 1 at 2 p.m., Jocelyn Duford returns to Concord with her acclaimed one-woman touring production, Jocelyn’s ABC: Adult Broadway Cabaret. Jocelyn was a teaching artist for the Arts Alliance of Northern New Hampshire and brought this and other performances north, and she’s happy to be returning the show to southern New Hampshire audiences. If you’ve ever seen Jocelyn, you know that she’s a stunning, hilarious performer with a knack for characters and a gorgeous, versatile voice. You truly don’t want to miss this ever-evolving tour-de-force showcase. She’ll be accompanied by Jamie Feinberg. Tickets are available now! Time to round up some friends for a wonderful weekend of entertainment. Please help us spread the word and join us for an evening or two of wonderful music and theater! It’s back! The show you’ve been waiting for! Musical theater performer Jocelyn Duford brings her one-woman cabaret to Concord at the Hatbox Theatre, Wednesday, June 15 at 7:30 p.m. Local drag performer Amber Alyrt, a familiar face to NYMMT audiences, will make a special appearance. Tickets are $16.50 for adults or $13.50 for students under 18 (including a $1.50/ticket fee) and are available at www.hatboxnh.com or at the door as space allows. Please note that this show is recommended for ages 12 & up due to a few songs with some adult language. The show, which features one musical theater song for each letter of the alphabet, is at times hilarious & poignant as Jocelyn changes wigs, costumes & characters while showcasing the talent and artistry she is becoming known for. She may call upon a few audience members to assist her too! The solo performance draws on music from both well-known shows like Gypsy and Peter Pan as well as lesser-known shows like See What I Wanna See and Bring It On. She’s brought this show to Gorham and to Derry, and we’re thrilled to bring it to Concord audiences! Jocelyn’s special guest for this performance is Amber Alyrt, a local drag performer. Amber, who frequently performs in Manchester and Boston, is the new host of Spoiler Alyrt, a weekly drag show, as well as Spoiler Alyrt: Variety Show, a variety show of drag, theater, music and more in the old-fashioned variety show tradition. That show is the first Wednesday of every month, and all of the Spoiler Alyrt shows are at the Breezeway Pub in Manchester. Amber will be familiar to local theater audiences as well, as her alter ego has been recognized three times at the New Hampshire Theatre Awards, including twice for us! Jocelyn Duford is increasingly becoming a familiar face to musical theater audiences in the region. She has performed with the Palace Theatre, Not Your Mom’s Musical Theater, Stage 284, the Majestic Theatre and many more, and she recently opened her own theater education company, Theatricks of the Trade. Jocelyn is also a member of Not Your Mom’s Musical Theater’s touring company, most recently performing in The Musical of Musicals: The Musical! in VT and NH. Jocelyn will be accompanied by pianist Jamie Feinberg. Learn more about Jocelyn at www.jocelynduford.com. Because it’s closing, of course…leave them wanting more, right? On November 22, Not Your Mom’s Musical Theater presents the final concert in its Something Wonderful I Missed concert series. The series has been sponsored in part by Appletree Business Services. Not Your Mom’s Musical Theater’s final concert in its series on musical theater history explores the 2005 Broadway and off-Broadway seasons! Take a trip back and explore musicals like The 25th Annual Putnam County Spelling Bee, Little Women, Spamalot, Dessa Rose, The Light in the Piazza, The Great American Trailer Park Musical and many more, including selections from See What I Wanna See, performed by NYMMT in the fall of 2012. The concerts are emceed by local performers and personalities who will illustrate the often ridiculous and always interesting history of the songs. 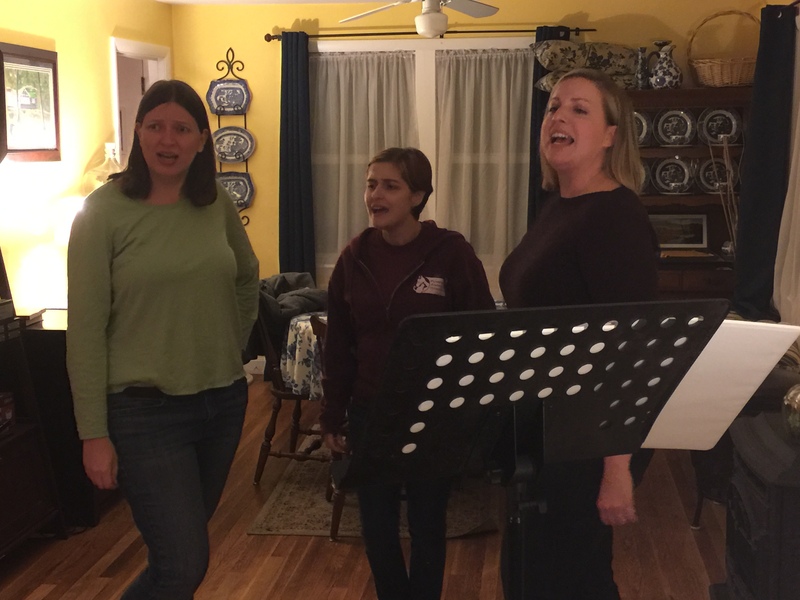 This concert, the final one in the series, features more than a dozen of southern New Hampshire’s best musical theater performers. November 22nd’s 4 p.m. concert at the Derry Opera House will be followed by a free reception and presentation in celebration of four years of concerts in the Londonderry/Derry area. When the series is complete, the cast will have performed twenty unique concerts (each with original scripts) covering twenty different years in musical theater history! The concert is directed by Jamie Feinberg and the cast is the company’s largest to date, with all who have participated in past concerts invited to join for the final song. (RSVP by November 15 if you want to join the cast!) This concert features Mario Arruda, Ross Boyd, Amber Byron, Christie Conticchio, Jocelyn Duford, Lauren Friedman, Rose Harmon, Don Higgins, Allyson Holmes, Dan Holmes, Elliot Owens, Sheree Owens, Judy Pancoast, Jessica Plummer, Melody Reese, Angelica Rosenthal, Deb Shaw and Joey T. Jamie Feinberg and Tom Holmes accompany, with assistance from Jesse Reese. Tickets can be purchased at the door. Suggested donation for admission is $10 adults, $5 students to insure that all are able to attend the performance. All audience members will receive a free ticket to participate in the Audience Choice raffle! Melody Reese, Sheree Owens and Jessica Plummer rehearse “I Gave It Away”, part of a special video presentation for the 2005 concert.